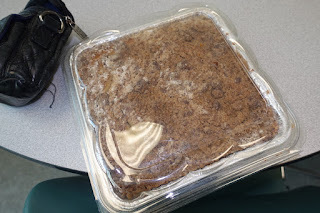 Cake Hour Cackle: A quick cake from Stop and Shop! Someone had to make a quick errand and since it was near and available Stop and Shop why not run in and get a quick cake for Friday afternoon! It was like bakery Grab and Go. 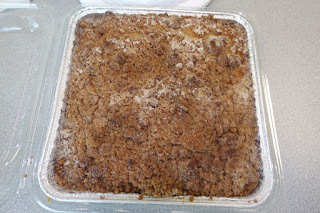 The choice was an Apple Cinnamon Crumb Cake. 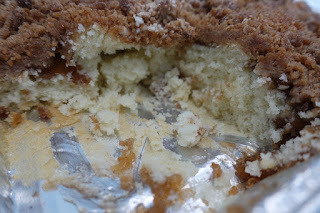 As you can see a square yellow coffee cake, covered with a cinnamon streusel and with apple compote or something similar sort of swirled between the cake and the coating. It came with a quick remove cover. Underneath there was an enticing layer of the streusel. The cake itself was very moist, not too sweet and the apples and cinnamon were nice additions to an otherwise standard coffee cake. Not a bad selection for a quickie cake!